There are 99 Sears models that have never been found. Some of these models are unusual looking--unusual enough that if you ever came across one you would likely remember seeing it. Here are six of the most distinctive undiscovered Sears models. Have you seen any of these? Email me! No. 264P158. Customers built this house in New York, NY and Terre Haute, IN. Were those the only two built? No. 264P158 was a sizable house--24' x 44'. It featured a huge reception hall, large living room and dining room. It had an extremely large kitchen for the time and also an attached pantry. It had a servant's room on the first floor, and four bedrooms upstairs--one being exceptionally large for the era at 12' x 18'. No. 264P158 was not a house for just anyone, which certainly accounts for its rarity. No. 138. The porch roof is oddly shaped, with a cut-out. There is a teeny dormer in one of the upstairs bedrooms that originally had colored art glass. 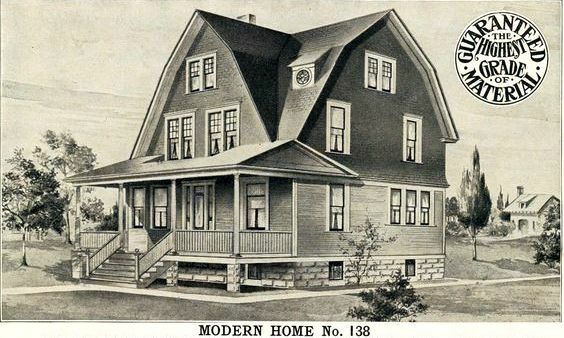 This house was sold for only one year, and then Sears designed a completely different No. 138. Scan courtesy of Dale Haynes. The Edgemere (also known as No. 199) was sold between 1911 and 1918. It is a small two-bedroom house with ornamental detail like exposed rafter tails, eaves brackets, and decorative flower boxes. 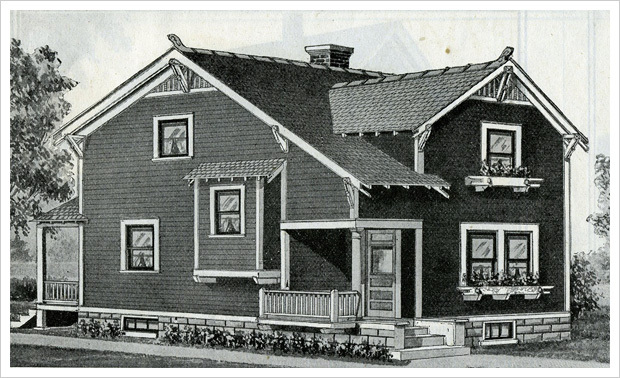 The front door is covered by an overhang, and then there is an unnecessary sloped roof over the porch. According to Sears Roebuck, customers built this model in Northwood, IA, La Porte, IN, Osgood, IN, Havre de Grace MD, Ann Arbor, MI, and Massillon, OH. None of these houses have been located. No. 204 was sold 1911-1913. It almost looks like a house from today that has had an awkward second story added. The square windows on the second story are an enclosed sun porch. 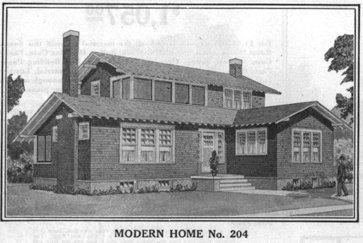 The Vinita from the 1921 Modern Homes catalog. The Vinita was sold 1920-1922. It was part of the Sears "Econo-Bilt" line of homes, which was a cheaper quality product than the "Honor Bilt" homes we typically see. What I find interesting about the Vinita is the busyness of the paneled walls. Today, those walls are likely sided over and the trellised entrance may be removed as well. 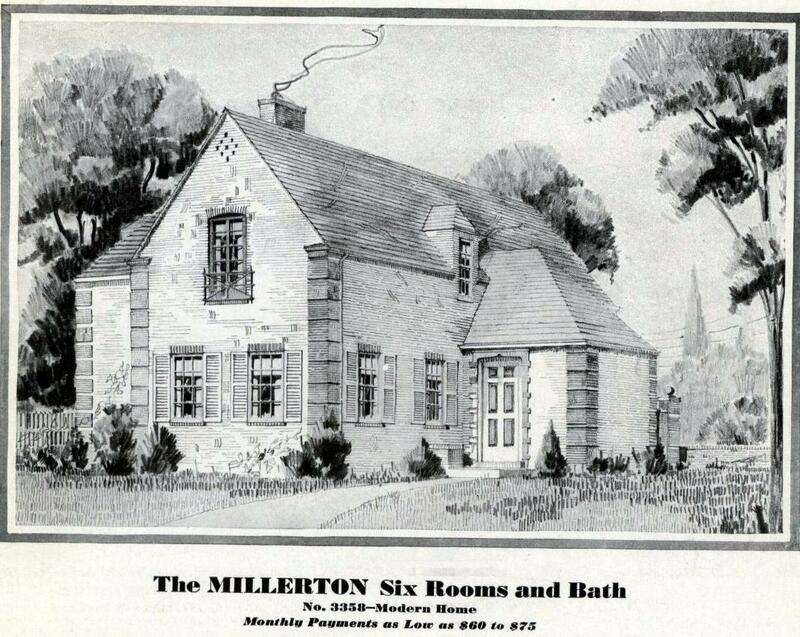 The Millerton was sold for only two years--1931 and 1932. One of the odd features of the Millerton is that the front door and a rear door are both housed on that projection. The dormer seems crammed in too close to the roofline of the front entrance. I will bet that this model is hiding in the Chicago area somewhere. These are all very interesting houses! 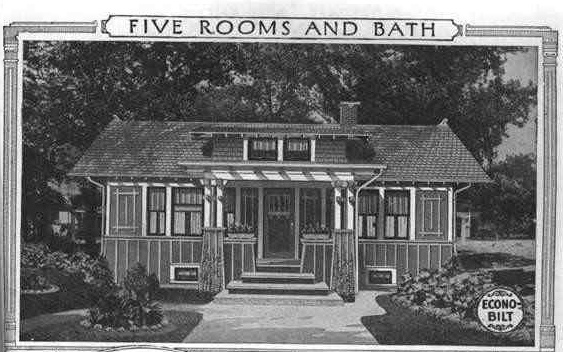 I would guess that number 5, the Vinita, might have been a popular seller but, as you note, exterior alterations to subdue the exterior would be expected and would definitely make the house much harder to recognize today. I'm surprised that as many as 99 Sears models have never been located. Is it possible that Sears offered houses which simply never sold? I hope to run across one of these six in the future! Yes, I think it's possible that there were models that didn't sell. There were many "one-and-dones"--offered in the catalog one year only. There were big, expensive homes in the list of 99 that most buyers couldn't afford. There were little simple ones that may have been built but were likely demolished or added onto so much we couldn't recognize them. I'll bet we'll locate at least 30 of the remaining 99. As more mortgage records become digitized we'll be able to find the houses that Sears Roebuck financed all over the country.